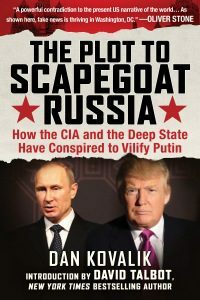 Kovalik is author of the recently-released book The Plot to Scapegoat Russia: How the CIA and the Deep State Have Conspired to Vilify Russia. He teaches international human rights at the University of Pittsburgh School of Law. “In an interesting, and indeed tragic, twist of fate, the very types of Hollywood liberals who were once the victims of McCarthyism, are now the promoters of a new witch hunt and a new Cold War against Russia. This would be comical, if it were not so dangerous. “This incredible piece of jingoistic propaganda, which could have easily been made in the 1950s, is based upon the very untruths which formed the basis of the first Cold War – that the U.S. is a unique force for good in the world, and has been so, we are told by Morgan Freeman, for 241 years; and that Russia under Putin is a unique force for evil which must be eliminated at the roots. “Of course, none of these propositions are true. This is part of the mythology of American Exceptionalism, that the U.S. is somehow a beacon of democracy and freedom in the world. Far from it. It is the U.S. which has been busy toppling democracies and interfering in other nations’ political systems, many times partnering with right-wing forces to do so. And, this is not ancient history. Thus, just to name a few, Bill Clinton and his campaign team were critical in helping the drunkard Boris Yeltsin win (or, more accurately, steal) the 1996 elections in Russia. For her part, Hillary Clinton was critical, by her own admission, in solidifying the brutal Honduran coup in 2009; and then in leading the charge to topple Libya’s government in 2011, thereby leading to the chaos that now reigns in that country. “Meanwhile, Vladimir Putin, far from plotting revenge on the U.S., was the first world leader to offer condolences and help to the U.S. after 9/11, and then gave such help to the U.S. in its operations in Afghanistan shortly thereafter. Putin also helped Obama negotiate the Iran nuclear deal, helped rid Syria of its chemical weapons and recently hosted leaders from both North and South Korea to try to prevent a nuclear war on the Korean peninsula. “Putin is hardly the menace portrayed in the Western press, and Russia is no threat to the United States. There’s anti-Russian hysteria which appears to be gripping the U.S. and which continues to be stoked on a nearly daily basis, including by Freeman, Reiner and their right-wing friends on the anti-Russia Committee, James Clapper, Max Boot and Norman Ornstein.